Sherry vineyards and bodegas in Jerez. Day trip . Sherry vineyards and bodegas in Jerez. Day trip . This particular region of the province of Cadiz in South West Spain is formed by three towns: El Puerto de Santa María, Sanlúcar de Barrameda and Jerez de la Frontera. This tour will take us to Jerez, the biggest of the three. We will start by visiting a vineyard, where we will meet a couple of lovely local oenologists. They will take us for a small walk through their beautiful vines, where they will explain the particularities of the soil, the climate and the grapes that make Sherry so unique. 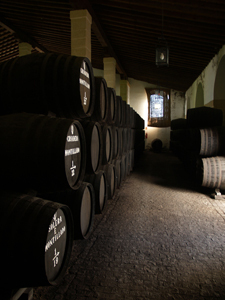 With all this knowledge, we will drive into Jerez old town to visit a very special sherry bodega where Sherries are carefully aged and we will do some tasting there. After sampling the wonders of the local wines, we will have a fabulous lunch in a local restaurant. This foodie day trip is ideal for people staying in other locations in Andalusia wishing to visit Jerez and learn about Sherry. It includes private transportation in a modern and comfortable vehicle with A/C to and from your accommodation. Your personal guide and driver will pick you up in the morning and will drive you back in the late afternoon after spending a great day together in the Sherry capital.